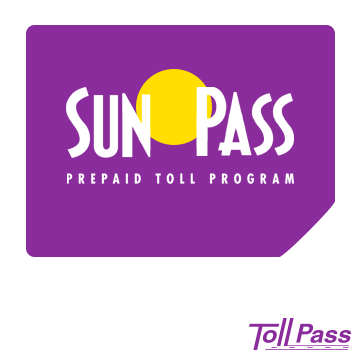 Florida's prepaid toll program is called Sun Pass. 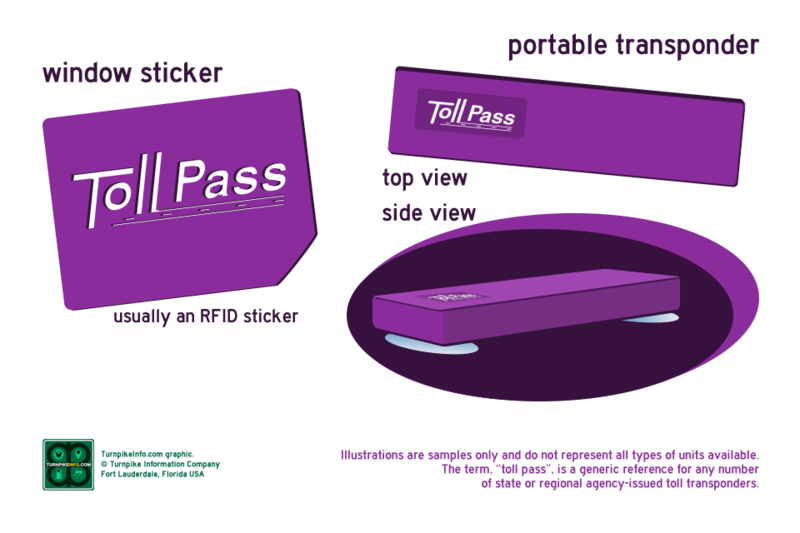 It is similar to the E-ZPass electronic toll system. Sun Pass is compatible with the Georgia Peach Pass and the North Carolina Quick Pass, so Sun Pass users can drive express lanes and toll roads in Georgia and North Carolina. 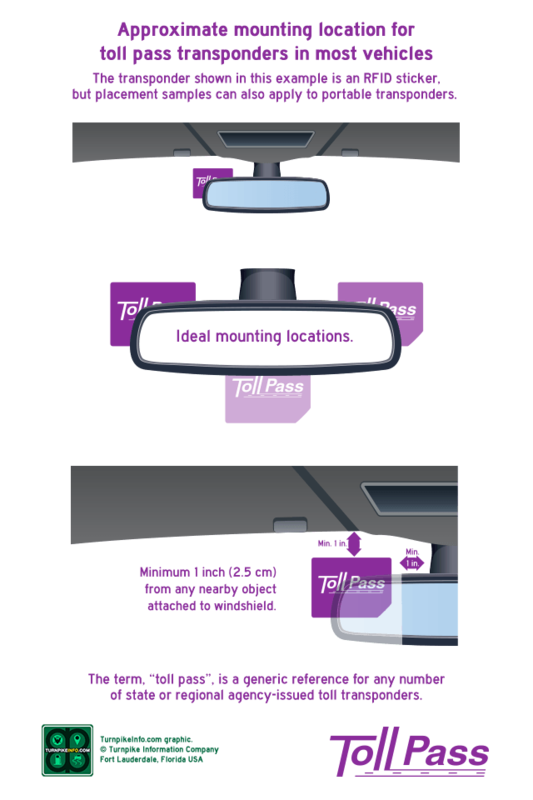 The SunPass comes in three types of transponders: a full-size transponder that sticks to your car window using suction cups, and a SunPass Mini sticker, which is usually meant to remain in one car only or to be temporary. The third type is designed for large commercial trucks and tractor-trailers, and this type attaches to the front license plate or to the roof of the vehicle. The Central Florida Expressway Authority issues what is called an E-Pass transponder. E-Pass may already be used on all Florida toll roads, so drivers with an E-Pass may use the Sun Pass lanes outside of the Orlando Metropolitan area. 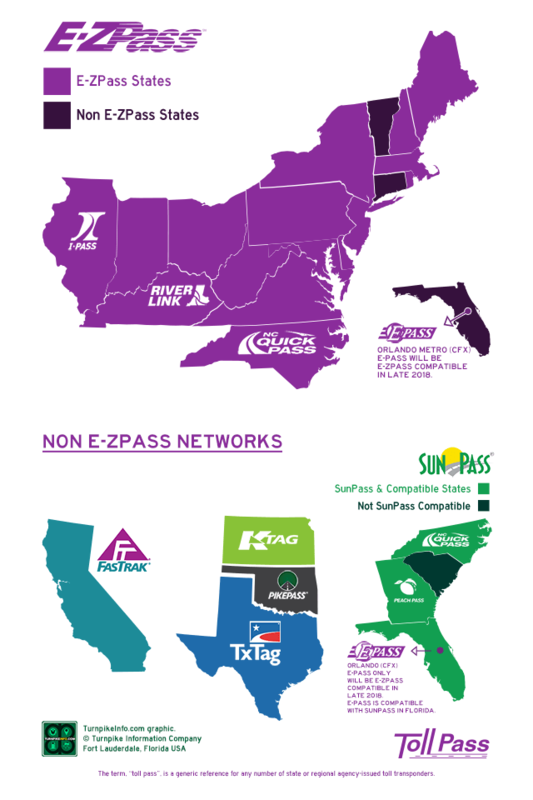 E-Pass lanes will be compatibile with E-ZPass beginning September 1, 2018; however, compatibility will not extend to all roadways. Read the news story for more information. It is important to note that E-ZPass will be able to work on CFX roads, but E-Pass will not work on E-ZPass roads. Lee County issues its own transponder, called the LeeWay. LeeWay is the discount transponder program for commuters using the toll bridges in Lee County and southwest Florida, including the Cape Coral Bridge, the Midpoint Memorial Bridge and the Sanibel Causeway. Any Sun Pass holder, Orlando drivers with a CFX EPass, and LeeWay Pass holders, from Lee County, may use all SunPass lanes on any Florida toll road or bridge. SunPass users may use any LeeWay lane in Lee County or any E-Pass lane on the Central Florida Expressways. E-Pass holders may also use any LeeWay lane in southwest Florida. The following lists show which passes are accepted on this state's toll roads. 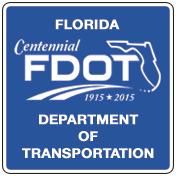 Orders for Florida are handled by the Florida Department of Transportation. Order links will take you to the Florida SunPass website. The SunPass Personal Prepaid account is for personal, non-commercial users who have privately-owned cars, trucks, motorcycles or the like. Generally, SunPass Personal Prepaid accounts have ten (10) transponders or less, whether portable or sticker-type transponders. Once you acquire your first SunPass, activation will require a $10 minimum toll deposit for the sticker account, and a $25 minimum toll deposit for the portable unit. The SunPass Commercial Prepaid account is for commercial business or companies. A Federal Employer Identification number (FEIN) is required to open a Commercial Prepaid account. Accounts of this type permit businesses to have an unlimited number of transponder tags registered for a single account. The vehicles must be owned or leased by the business. Once open your Commerical SunPass account, activation will require a $50 minimum toll deposit, but the deposit amount will vary, depending up the estimated usage on the account. For company vehicles or vehicle fleets of three or more axles. Requires submission of Commercial SunPass Account application.